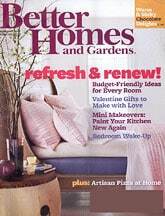 Click here to visit the FreebieMag site and fill out the form to request a free one year subscription to Better Homes and Garden magazine. If they show you any offers, just click “No” to them. The last page shows you more magazine offers. Just scroll all the way down and click “No thanks” and you’re done.